Educators are complaining about surreptitious and even overt use of cell phone texting during class. The premise of this paper is that cell phone texting is not the problem; it is merely a symptom of a lack of highly engaging instructional strategies. In the absence of highly engaging external stimuli, students turn to alternative sources of stimulation: External (texting) or Internal (mind-wandering). Both of these alternative activities engage the social cognition network, the default network of the brain. By adopting highly interactive, engaging instructional strategies, we treat the disease, not the symptom. In the process we create greater liking for class, content, and teacher, and support proven acceleration of achievement. Here we explore: 1) How traditional instructional strategies fail to provide engaging external stimuli; 2) How non-engaging instructional strategies that fail to activate the social cognition network predictably lead to texting and mind-wandering; and 3) How texting and mind-wandering can be radically reduced or eliminated by adopting alternative instructional strategies that provide high levels of stimulation and activation of the social cognition network. I have now done workshops in 35 countries and have toured classrooms in those countries. In each country the dominant instructional strategy is Whole-Class Question-Answer (WCQA). 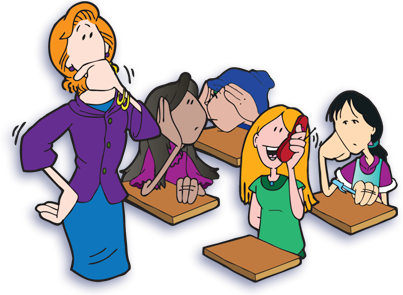 During a lecture or presentation, in an attempt to produce active engagement the teacher stops presenting and asks the class a question. Students who feel they would like to answer raise their hands. The teacher then calls on one student to answer. After the student answers, the teacher responds to the answer, offering an acknowledgement, praise, an augmentation, or a correction. This traditional instructional strategy sequence is bankrupt with regard to producing active engagement among students. The math of it reveals WCQA is exquisitely designed to produce disengagement. For example, in a class of only thirty students, if the teacher did no talking at all and wanted to give each student a minute to verbalize their thoughts, calling on students one at a time would take thirty minutes. In fact, during WCQA the teacher talks about half the time, first asking the question and then responding to the answer. Thus it takes about two minutes to allow one minute of active engagement per student. This means that during WCQA, if students in a class of thirty participate about equally, the maximum each student can talk is about one minute per hour. In fact, however, many students choose not to raise their hands so their active participation is zero minutes an hour! In larger lectures or if the lecturer chooses not to ask the class questions, the active engagement of students is far less than one minute per hour. Behavioral engineers could not design greater disengagement! The lack of active engagement during instruction is particularly problematic because students have become accustomed to a very high level of stimulation. They have become accustomed to a steady diet of multimodal input including MTV, DVDs, YouTube, video games, and the Internet. The pace of stimulation has increased exponentially. To view, literally view, how the pace of stimulation has multiplied, simply watch a movie made thirty years ago. Everything moves slowly. We become bored, anticipating action that does not happen. So too is it with today's youth in a lecture. They are bored, having become accustomed to fast moving multi-media stimulation. Whereas yesterday's instructor could hold the attention of students with straight instructor talk (because that was the most stimulating game in town), today's instructors rarely can. Finding teacher talk boring, students seek alternative stimulation via texting and mind-wandering. The predictable results of non-engaging instruction are texting and mind-wandering. To understand why this is so, we need to take a detour to understand the social cognition network in the brain, and to overview the research on mind-wandering. Our brains have distinct neural tracks dedicated to figuring out the minds of others. 1 Contrary to what was believed for decades, new research demonstrates that brain structures involved in working memory and nonsocial reasoning are not involved in social cognition or mentalizing. Mentalizing is figuring out what someone else is thinking, feeling, or intending. The structures in the brain that are responsible for mentalizing are part of the social cognition network located mostly in the medial (midline) regions of the brain in contrast to the working memory and fluid intelligence structures which are located in the lateral (outer) surface of the brain. We have an entirely independent social cognition brain network! That this social cognition network is located in a deeper part of the brain indicates it evolved earlier. We are fundamentally social beings. That the social cognition network is our default network means we are primed to look for thoughts, feelings, and intentions in others. We even extend this proclivity to impute feelings and intentions to objects. 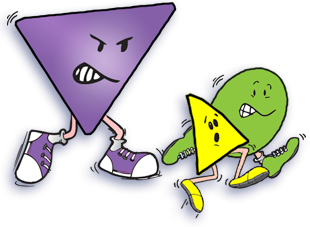 For example, when shown a motion picture of triangles, a circle, and an open box with the geometric figures moving, normal children and adults attribute feelings and intentions to the objects, "the big triangle is a bully that is picking on the small triangle and circle, who are running scared but then…. "6 Autistic children, who have a deficit in social cognition, describe the same objects and movements objectively. They do not impute feelings or intentions to inanimate objects: "the big triangle went into the rectangle. There were a small triangle and a circle. The big triangle went out. The shapes bounce off each other…. "7 Our normal default mode is to look for thoughts, feelings and intentions of others, and even attribute them to inanimate objects! Our default mode of cognition is social cognition. We are social creatures. Social and non-social reasoning are carried out by different brain structures. Thinking about the academic content is carried out in an entirely different place in the brain than thinking about a girl's potential response to a request for a date! When subjects read sentences that do not involve figuring out what someone is thinking, feeling, or intending, the lateral prefrontal regions of the brain associated with language, working memory, and fluid intelligence become engaged. In contrast, across a number of studies, when subjects read sentences that involve mentalizing, thinking about the thinking of others, their social cognition network goes into action. The regions involved with working memory and fluid intelligence are quiet. The social cognition network consists of four structures: The dorsomedial prefrontal cortex (DMPFC), the tempoparietal junction (TPJ), the posterior cingulate, and the temporal poles. These two distinct networks of brain structures actually work antagonistically.8 Thinking about nonsocial, task-related content shuts down thinking about the thoughts, feelings, and intentions of others, and mentalizing shuts down thinking about nonsocial tasks. We have a social IQ and a task IQ, but we can't operate both at once! The implication: We have a social brain distinct from our nonsocial brain! Knowing what others are thinking is so important that our brains dedicate special, independent circuits for that purpose.